Start your tour with a pickup from your Mykonos hotel, or make your own way to the port to meet your guide and group. 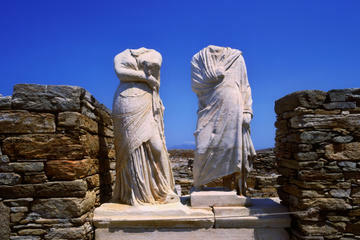 Then, hop aboard your ferry and relax as you cross a stretch of the Aegean Sea to the nearby island of Delos. Now listed as a UNESCO World Heritage site, the sacred island is believed to be the birthplace of the Greek gods Apollo and Artmenis and boasts ruins that date back to Ancient Greece. Cruise into the harbor, board your coach, and travel to the main excavation site where a staggering collection of relics awaits. On a walking tour with your guide, make your way around the agora, the ancient market place where merchants from neighboring countries would meet. Stroll past the Sacred Lake, pose for photos by the Terrace of the Lions  one of the islands best-known sights  and gaze in awe at the ruined grandeur of Delos ancient theater. See old living quarters, such as the House of Dionysus, that hint at the daily lives of islanders in bygone days, and hear tidbits of enthralling Ancient Greek history that put all the sights into historical context. After viewing the Temple of Isis, a sculpture of an Egyptian goddess and various Roman water cisterns, head inside the Archeological Museum of Delos to browse an array of mosaics, statues and other artifacts found during excavations on the island. After your walking tour finishes, hop back inside your minibus and return to the port to catch your ferry back to Mykonos. Say your goodbyes to your guide after disembarking, or finish your half-day tour with a hotel drop-off.